In this version I used small white round potatoes. 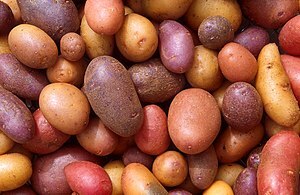 For a more dramatic effect of color, use small red round (new) potatoes. Preheat the oven to 325º. Place potatoes in a medium size bowl. In a small bowl, mix remaining ingredients. Pour the mix over the potatoes and stir well to coat. Pour the potatoes and residual mixture into a small 1 qt. casserole dish. Potatoes should be in a single layer. Adjust your casserole dish size to suite the amount of potatoes you have. Bake at 325º for 45 minutes. Stir the potatoes to ensure even roasting, then bake an additional 10-20 minutes when they should be tender and browned on the edges. Thank you for such a lovely complement!